Musical activities, arts & crafts, workshops, games, a new rhyme, physical challenges, and a lot more fun for little clowns in training. Word flashcards, memos, activity sheets, group identification cards and posters, games, crafts, and many other clown-themed documents. Set exercise mats on the floor so children can practice a variety of acrobatic moves throughout the theme. Add scarves, balls for juggling practice, hula hoops, makeup, clown costumes and accessories, clown hats, a mirror, and clown noses. 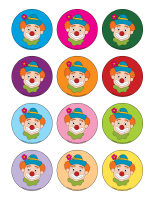 (Open educa-theme-Clowns) Print and laminate the different elements representing the theme. 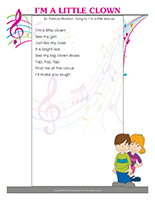 Use them to present the theme to your group (and their parents) while decorating your daycare. 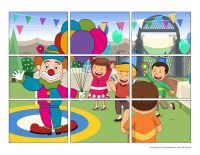 (Open educa-decorate-Clowns) Print, laminate, and cut out the illustrations. Use them to decorate your walls and set the mood for the theme. Prepare a special clown mailbox. 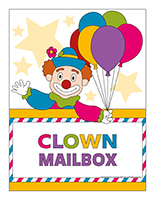 (Open poster-clown mailbox) (Open memos and stamps-Clowns) Deposit cards, memos, and surprises in your mailbox throughout the theme. Purchase an official clown mailbox. Use a cardboard box (shoebox, cereal box, etc.) and decorate it with accessories related to the theme. Recycle an old metal coffee can and transform it to make it look like a mailbox. Hang a gift bag from a hook or door handle and identify it as your clown mailbox. 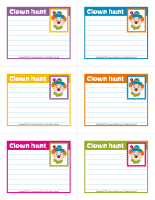 (Open surprise memos-Clowns) Print the special clown-themed memos. Hide them throughout your daycare. Every time a child finds a clown memo, read it to your group and enjoy the surprise. (Open group identification-Clowns) Print and display the posters and labels. 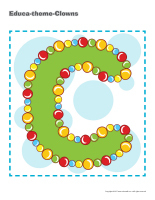 Use them to decorate your daycare and identify children's personal belongings and spaces. Use circle time to encourage children to perform a variety of exercises and introduce your theme. Where is the clown hiding? Every morning during the theme, hide a clown figurine (or a clown illustration) within your daycare. Hide the clown per the ages of the children in your group. Finding it must represent a challenge. As soon as children find it, take a picture and print it. Use the pictures to decorate a special thematic wall. Children will enjoy discussing how they found the clown with their parents at the end of the day. Wear a different clown hat or wig to greet children each day. Name a child who will be the chief clown each morning. The chief clown shall enjoy privileges throughout the day. (Open picture game-Clowns) Print and laminate the pictures in the format you prefer. Use them to spark a conversation with your group. Ask children questions about clowns. Do you know any stories about clowns? Where can we see clowns? Have you ever met a clown? The pictures may be used as a memory game or to spark a conversation with the group. Use them to decorate the daycare or a specific thematic corner. 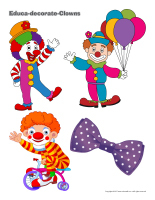 (Open picture game-Clowns) Print, laminate, and store in a "Ziploc" bag or in your thematic bins. (Open picture game-Clowns) Print the pictures twice and use them for a memory game. 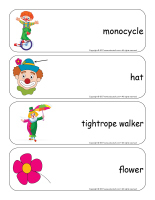 (Open writing activities-C like clown) Print for each child or laminate for use with a dry-erase marker. (Open educa-nuudles-Clowns) Print for each child. Have children color the sheet and use Magic Nuudles to give it a three-dimensional look. Variation: You don't have Magic Nuudles? Have children fill the spaces designed for Magic Nuudles with bingo markers or stickers. To order Magic Nuudles. (Open stationery-Clowns) Print. Use the stationery to communicate with parents, in your writing area, or to identify your thematic bins. Multicoloured blocks children can use to build circus tents and animals. Animal figurines (namely circus animals). Set a colourful blanket on the floor. Colourful arts & crafts materials. Recycled containers that can be used to create oversized circus animals. Colourful pieces of fabric to create circus tents. Circus animal figurines and paint for making impressions on paper. Animal models and stencils for drawing and crafts. Arts & crafts materials for making masks. A safari-style costume to dress up like a lion tamer. Add hula hoops. Various circus accessories such as wigs, scarves, balls, a clown nose, costumes, etc. for representing a variety of characters. Makeup for face painting fun. Memory game involving educatall.com picture game. Clown faces with magnetic parts. A box filled with wigs and clown noses children can wear as they explore books. Circus-themed word flashcards displayed on a wall. Circus posters to decorate your area. A container filled with soap and water. A container filled with bubble solution and blow tons of bubbles. 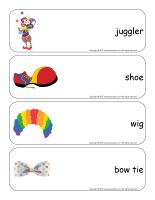 (Open word flashcards-Clowns) (Open giant word flashcards-Clowns) Print and laminate the word flashcards. Have each child pick a word and present it to the group (ex. wig). Ask them questions to see what they know about the theme. 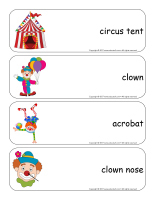 (Open word flashcards-Clowns) (Open giant word flashcards-Clowns) Print, laminate, and display the word flashcards on a wall close to your circle time area or on a large piece of cardboard you can move within your daycare. Children take turns identifying the words you name. (Open giant felt board game-Clowns) Print the items and glue them on pieces of colourful felt. Glue four pieces of black felt on a piece of cardboard and display your felt board on a wall. The felt shapes will easily stick to the felt board. Children will enjoy creating different scenes and stories. (Open educ-chat-The circus) Print and laminate the cards. Use the subjects, verbs, and predicates to help children make complete sentences and add to their vocabulary. Arrange the cards in three piles (subjects, verbs, predicates). Ask children to take turns picking one card from each pile and "reading" the sentence. The sentences may be quite silly! If you prefer, place sets of three cards in a row and have children "read" the sentences. 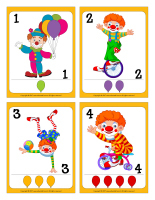 (Open educa-decorate-Clowns) Print and secure the illustrations on the floor with adhesive paper. 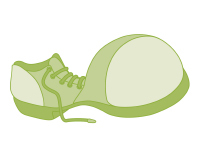 Use them to create a path that connects various areas within your daycare. (Open transition games-Clowns) Print each illustration twice. Use adhesive paper to secure one copy of each illustration on the table. Deposit the second copy of each illustration in an opaque bag and invite children to pick a card that will determine their spot at the table (corresponding illustration). The illustrations can also be used to determine children's naptime spots or their place in the task train. Use adhesive tape to draw a giant hopscotch game on the floor. It could connect two areas within your daycare. Make sure children alternate hops on one and two feet. Add clown pictures in each square. (Open perpetual calendar-Special Day-Clown Show) Print and display the calendar to inform parents and children of upcoming activities. (Open schedule-Special Day-Clown Show) Print. Add your planned activities and display. 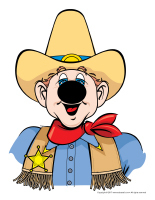 Purchase a clown nose for each child in your group and distribute them as children arrive in the morning. Use them to spark a conversation about the circus. 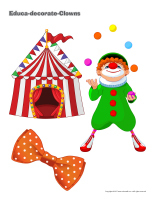 Ask children if they have ever been to the circus, what types of acts are part of a circus, etc. Gather a variety of silly, colourful clothing items. 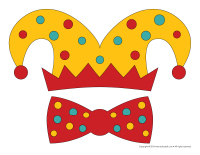 Use large pieces of poster board to shape cones and decorate them to make clown hats. Purchase colourful wigs. To complete your clown costumes, paint children's face white and draw an oversized red smile. Remember, no two clowns are alike! (Open clown costume) Print and stick each child's mask on a wooden stick or glue the ends of an elastic on either side so it's easy for children to wear. (Open clown glasses) Print the model and trace it on heavy cardboard. Cut out the centre of both lenses and glue cellophane paper to the frames. (Open clown hat) Print and cut out. Have children color and decorate their hat. 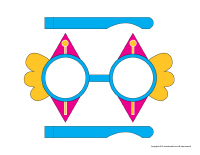 (Open photo booth-Clowns) Print the various accessories, cut them out, and glue a drinking straw behind each one. Purchase hats, lightweight scarves, oversized glasses, etc. at your local dollar store. Create a circus-themed décor using a large piece of cardboard or a curtain. Invite children to pick the accessories they prefer and pose for you. You can take individual, group, or family photos. Print the pictures and display them on a wall for everyone to see. During summer, the following activities can be organized outside. Prepare a stage. Add hair gel and color to children's hair to create silly hairstyles. Provide makeup, a mirror, and a variety of clown accessories. Encourage each child to prepare a brief clown show and invite them to take turns presenting it. You can use your parachute to represent a circus tent. Simply hang the centre of your parachute from the ceiling. Organize several circus workshops involving hula hoops, a play tunnel, jumping ropes, etc. Set a long rope on the floor and invite children to walk on it while holding an umbrella. 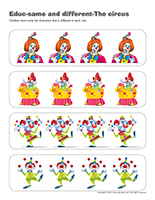 (Open finger puppets-Clowns) Print and laminate the puppets and cut out the finger holes. Show children how they can insert their fingers to move the puppets and create simple scenarios. Prepare clown pizzas. Give each child a ball of pizza dough and let them flatten it to form a circle and decorate it as they wish. Provide vegetables they can use to represent eyes, a nose, and a mouth. Add spaghetti to represent a clown wig. If you wish, let children use additional veggies to represent circus animals, flowers, etc. (Open picture frames-Clowns) Print and use the frames to display pictures of your special day and to send pictures home with children as souvenirs. 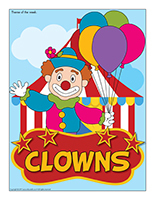 (Open playing cards-Clowns) Print and laminate. Give each child the same number of cards. Let them take turns hiding the clowns. As a group, hunt for the clowns. 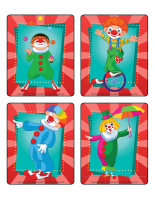 (Open playing cards-Clowns) Print and laminate several playing cards. Hide them throughout your daycare or yard. Divide your group into two teams. When you give the signal, children must try to find as many cards as possible in a pre-determined period, for example 3 minutes. (Open miniature clowns) Print and laminate. Hide the clowns within your daycare and invite children to search for them. The child who finds the most clowns can hide them for the next round. (Open models-Clowns) Print, color, and laminate the models. Stick them on walls, cupboards, the floor, etc. Let children discover the clowns throughout the day. Pick a child who will be the clown. The clown tries to catch the other children. When he succeeds, the child who was touched becomes the clown. Set up several different circus-themed stations. Juggling station: Fill a container with a variety of items that can be juggled (balls, scarves, plastic bowling pins, bean bags, etc.). Encourage children to try juggling them. Tightrope walking station: Set jumping ropes and a balance beam on the floor. Hand each child an umbrella and invite them to hold it up as they walk along the ropes and beam. Clown station: Set up targets and provide balls children can throw towards them. Have them wear a clown wig and nose. You can also set up a bean bag toss game or simply use tennis balls and buckets. Lion tamer station: One child holds a hula hoop and the other children jump through it as if they were lions. Have fun attempting other circus tricks too. Inflate several balloons. The balloons must never touch the ground. Encourage children to use them to practice their juggling skills. (Open clown nose) Print. Display the clown on a wall or fence. Children take turns trying to stick the clown's nose in the correct spot while blindfolded (just like in pin the tail on the donkey). Build simple stilts using empty metal cans. Punch a hole on either side of each can, close to the bottom. Measure two long pieces of rope and thread one end of each rope into one of the holes. Secure the rope inside the cans with knots. To walk on the stilts, children must stand on the bottom of the cans, holding the ropes in their hands. It isn't as easy as you may think! Certain children may need a lot of practice. Make sure the edges of the cans aren't sharp. You may add heavy tape for extra protection. Spread a long rope out on the floor and have children imagine it is high up in the air. Have them walk along the rope barefoot. They mustn't set both their feet beside the rope. If they do, they have fallen to the ground! Have them move several different ways: backwards, hopping, crawling, etc. (Open miniature clowns) Print and laminate. Hide clowns within your daycare and have children search for them. The child who finds the most clowns can hide them for the next round. (Open picture game-Clowns) Print and stick the pictures on the floor throughout your daycare. You must have one illustration less than the number of children in your group (for nine children, use eight illustrations). Children walk around the pictures to the sound of music. When the music stops, they must quickly sit on a picture. The child who does not have a picture to sit on is eliminated. The game continues until there is only one clown left. (Open color by number-Clowns) Print for each child. Children color the picture per the color code. 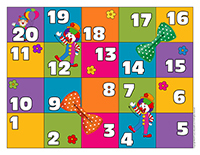 (Open snakes & ladders-Clowns) Print and laminate. Use a die and wrapped candy pieces as playing pieces. The goal of the game is for each child to reach the end of the board. When they do, they can eat their playing piece. (Open assemble the clowns) Print and laminate the pictures. Cut each one into three pieces (head, body, legs) and mix them up. Children assemble the clowns. 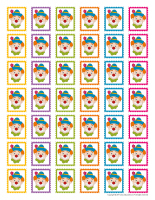 (Open educ-puzzle-Clowns) Print and laminate for durable, eco-friendly use. Encourage children to position the characters and accessories in the right places on the scene. (Open educa-duo-Clowns) Print and laminate for durable, eco-friendly use. Children must draw a line between items that form a duo using a dry-erase marker. 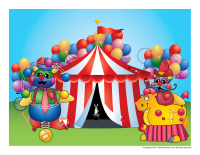 (Open educ-math-The circus) Print and laminate for durable, eco-friendly use. Children must count the items in each rectangle and circle the correct number. (Open hunt and seek-Poni-The circus) Print and laminate. Children pick a card and search for the item in the scene. (Open educ-shadows-The circus) Print and laminate for durable, eco-friendly use. Children must find the shadow that matches each item on the left and connect them by drawing a line. (Open educ-same and different-The circus) Print and laminate for durable, eco-friendly use. Children must circle the illustration that is different in each row. 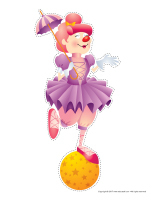 (Open lotto game-The circus) Print and laminate the game. Children pick a card and search for the item on their lotto card. If the item appears on it, they set it in the corresponding box. Otherwise, they set it on a pile in the middle of the table. The first player who completes his lotto card wins. 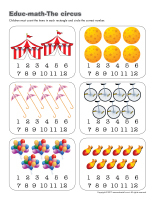 (Open memory game-Circus) Print the pictures twice and use them for a memory game. Fill a small bin with clown accessories to provide children with the opportunity to explore this silly character. Paint each child's nose red. Paint your own nose too. Encourage children to admire their silly reflection in a mirror. Give each child a different type of material: modeling dough, salt dough, buttons, feathers, pipe cleaners, cardboard scraps, aluminum paper, etc. Ask them to use the material they were given to represent a clown. Set mirrors and makeup pencils on a table. 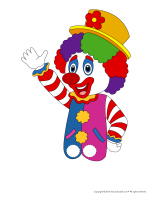 Let children paint their own face to represent a clown or other circus character or animal. Use colourful hair gel to create silly hairstyles. Invite each child to create a short clown show. Use your parachute to represent a circus tent. Simply hang the centre of your parachute from the ceiling. cutting it out. Attach a string or elastic on either side so children can easily wear their mask. Set several exercise mats on the ground and teach children how to perform somersaults. If you have a small hill in your yard, use it to make performing somersaults easier for your group. 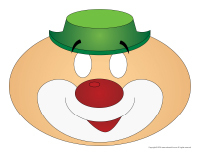 (Open clown hunt) Print and laminate the clown halves. Hide one half of each clown in your yard. Give the other half of each clown to a child. When you give the signal, children must search for the other half of their clown. 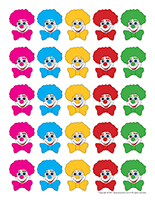 (Open transition games-Clowns) Print, laminate, and arrange the clowns on the floor. To the sound of music, children walk around the daycare. When the music stops, they must quickly find a clown to stand on. Set several hula hoops on the floor. Your little clowns dance around the hula hoops. When the music stops, each clown must find a "home" (hula hoop). Variation for younger children: To the sound of music, let children hop from one hula hoop to the next. You can hold very young children in your arms and hop in the hula hoops with them. Give each child a clown wig and nose. Drape a party garland around their neck as a scarf and paint their cheeks red. Provide musical instruments and parade around your neighbourhood. Don't forget to take pictures! With very young children, simply set a hat on their head, paint their nose red, and give them a musical instrument to manipulate. Fill a large gift bag with clown accessories. Have children sit in a circle and, to the sound of music, have them pass the bag around. When the music stops, the child holding the bag picks an accessory to wear. The game continues until the bag is empty. Wear clown noses and have fun making silly faces to make each other giggle and laugh. Invite children to walk around the daycare, balancing an object on their head like tightrope walkers. Challengeolder children by piling a few items one on top of the other. You may also encourage them to walk on a balance beam. Let children try to inflate balloons and encourage them to observe the associated phenomena (air entering the balloon when they blow into it and air exiting the balloon when they release the opening, the balloon getting bigger and smaller, etc.). Give each child one scoop of ice cream in a bowl. Set a miniature ice cream cone on the ice cream scoop, upside down. Provide tiny candy pieces children can use to decorate their clown. (Open mandalas-Clowns) Print for each child. Children must color the parts using bright colors. (Open puppets-The circus) Print the various models on cardboard. Ask children to cut them out and decorate them with arts & crafts materials. Glue a Popsicle stick behind each one to complete the puppets. (Open stencils-The circus) Print and cut out. Children can use the stencils to trace and paint a variety of items related to the theme. (Open models-Clowns) Print the models and use them for your various projects and needs throughout the theme. 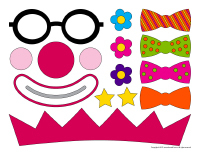 (Open educa-decorate-Clowns) Print and cut out. Glue the shapes around a construction paper headband or cone-shaped hat. (Open clown glasses) Print the model and trace it on heavy cardboard. Cut out the centre of both lenses and glue cellophane paper on them. (Open balloons-Clowns) Print for each child. Inflate one balloon per child. Let them glue the different pieces on their balloon to make it look like a clown. Hang the balloons from the ceiling. (Open my miniature clown) Print, cut out, and color the parts. Have children glue them on an empty toilet paper roll to create a miniature clown. Hang the clowns from the ceiling. (Open clown with moving parts) Print for each child. Cut out the pieces and let children decorate them with markers. Use fasteners to hold the parts together where indicated. Give each child a paper plate. Cut two holes out of the plate (eyes). Provide yarn, fabric, construction paper, markers, etc. Children use the materials to represent a clown face. You will need two empty tissue boxes per child. Provide a variety of materials (foam shapes, tissue paper, confetti, yarn, ribbon, etc.). Children use the materials to decorate the boxes and make them look like clown shoes. When they are done, children can slip their feet in the boxes. 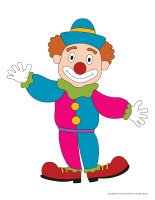 Give each child a simple clown picture or illustration. Prepare plain popcorn and encourage children to stick popcorn on the clown. If you prefer, use crumpled pieces of tissue paper. 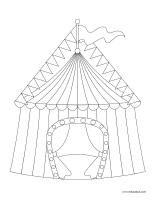 (Open circus hat models) Print and trace the models on colourful construction paper. Have children cut out and decorate their hat. Staple the ends together so they can wear their hat. Give each child a Styrofoam ball and have them paint it with red poster paint. They can roll their ball in glitter too. Thread a piece of string through a needle and use the needle to slide the string through the ball. Use the string to tie each child's nose around their head. (Open coloring pages theme-Clowns) Print for each child.